I played the challenges with some friends and we ended up in the first place winning a nice trophee, a Fortinet Firewall, some tshirts and other goodies. Thanks SCRT! 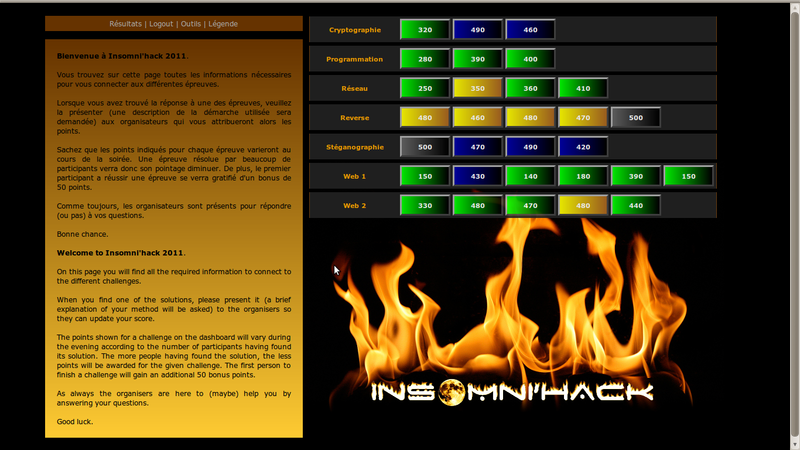 If you are interested in the challenges, shell-storm has mirrored some of them (offline ones at least) while Djo, Emilien Girault and Pascal Junod have already published some write-ups. Also, staff said they will publish all challenges and solutions soon. Last week-end were also Codegate 2011 qualifications, which I unfortunately did not play this year. Different kind of challenges, strong competition. Many write-ups have been shared by @codegate_yut. Also, some cool stuff ahead: Honeynet public conference, HITB Amsterdam CTF prequals, HES 2011, and maybe a Plaid Parliament of Pwning (PPP) CTF.